Everyone knows about distracted drivers. We all see people using their phones on the road. In the good old days, putting on makeup or eating behind the wheel were the worst things. Then came the cell phone. As if this didn’t provide anough distraction, the phones soon got GPS apps. Then came little GPS screens that could sit on the dashboard, and now, cars are coming with tablet sized monitors right in the dashboard. If you’ve ever been in a taxi in a big city, you know to wear a seat belt and brace yourself for potholes, lane swerving and unexpected accelerations. 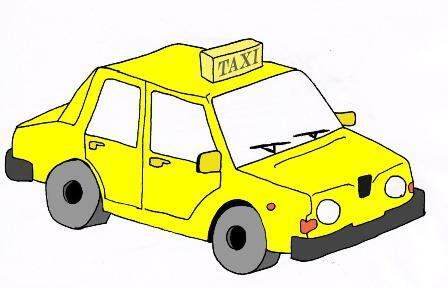 Even the most sedate cab ride can be a challenge if your hand encounters a suspicious sticky spot on the seat, or you notice, after boarding, that your driver looks like he hasn’t slept in a month and when he did, he most likely slept in the taxi. Taxi drivers used to leave their communication radios turned up and passengers had the pleasure of hearing the calls and static. Then the drivers got cell phones, so they yakked to their families while driving. Now they have better phones and the phones have screens. They take business calls, they talk to their friends, and if they think about it, they might glance at the road from time to time. Recently, I got in a taxi at night at an airport. A minute after the driver pulled away, he received a call on his cellphone. He answered, “AIRPORT TAXI.” Then, apparently, someone started to give him an address. He reached for a small notebook and pencil and proceeded to write this down while simultaneously navigating a cloverleaf on ramp at high speed. From my seat in the back, I couldn’t tell–did he have either hand on the steering wheel? Fortunately, he ended the call when he had to merge on to the freeway. Just when I got my breath back, his phone rang again. This time he answered, “CITY CAB”. He had a brief conversation, then made a call on a different phone and assigned someone to a pickup. Yes, it could have been a comedy skit, but after 13 hours on airplanes I wasn’t in the mood to laugh. He continued to take calls the whole way. I was more than usually happy to reach my home! Yes, he is a very enterprising young driver, but I doubt he will live long enough to enjoy the fruits of his labor. In any case, I won’t be calling either of those taxi companies any time soon. There are alternatives to taxis, but they’re not necessarily safer. I recently rode a Super Shuttle where the driver had three large monitors arranged around the driver’s seat. We were hurtling down a highway at 70 mph and he seldom bothered to view the road ahead. Sometimes, yes, I say something like, “Maybe you should watch the road.” One driver agreed with me and seemed to be embarrassed. Most of them ignore it or blame their supervisors for making them work too hard. How much do you tip someone who almost gets you killed? Mickey Hoffman is the author of mystery novels School of Lies and Deadly Traffic. Visit www.mickeyhoffman.com for details. The only thing spookier than driving is being driven. I was on a bus a few weeks ago, and the driver kept falling asleep. I watched her head slowly drop, then jerk up. She’d stop the bus to walk around, then when she started driving again, the same things happened. Like something out of a horror movie. Maybe you have to tip them for not getting you killed. Scary. Mickey, I think I should thank my lucky stars I haven’t had to take a taxi lately. your accounts were indeed scary! Eeeeek!!! Yikes! I feel your pain. For over twenty years I traveled for a living. While living in the Chicago area, it was more cost effective to take cabs to and from the airport so I’m very familiar with the grabbing anything close by for dear life. Stay safe!